This opportunity is part of our Cultural Adaptations project: a European co-operation project, funded through the Creative Europe programme of the European Commission, running October 2018 – March 2021. 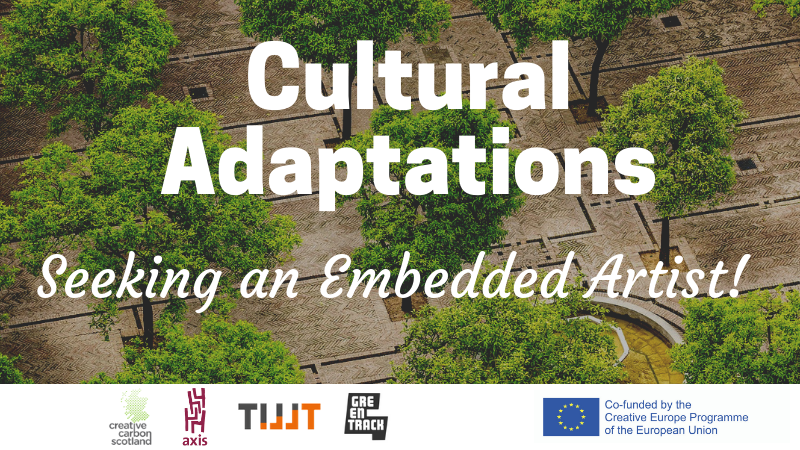 Four cultural organisations in countries with similar climate challenges but differing socio-political frameworks (Scotland, Ireland, Belgium and Sweden) will explore the different cultural approaches taken to our adaptation to climate change. Each Cultural Partner is working with a local Adaptation Partner on the project: Creative Carbon Scotland will be working with Sniffer and the Climate Ready Clyde Project; Axis (Ireland) will be working with Codema, Dublin’s regional energy agency; Greentrack Gent (Belgium) with the City of Ghent local authority; and TILLT (Sweden) with the City of Gothenburg local authority. Each country partnership will jointly research, develop, plan and implement their own Embedded Artist Project in which an artist is placed in an adaptation project in order to provide new ways of thinking, fresh perspective and different approaches to the complex and seemingly intractable challenges that climate change present. We are looking for an artist or cultural practitioner working in any art form to make use of their relatively autonomous position as an ‘outsider’ to help to provide new ways of thinking, fresh perspectives and different approaches to the challenges of adapting to climate change. They will be an active participant in and contributor to Climate Ready Clyde meetings, events and activities with stakeholders and partners including the Board, and lead on key areas of work to address specific challenges and opportunities within the Climate Ready Clyde programme. The Artist will have a particular responsibility to combine the environmental, social and cultural interests of the partners and ensure that this complex and novel but crucial combination of fields is understood and made use of by the wider Climate Ready Clyde board, and interested parties. See full Cultural Adaptations Embedded Artist Brief. The artist will be paid a total fee of £9,200 for the 28 days work. This is to include the artist’s travel to and around the Glasgow city region. Travel to, accommodation at, and subsistence costs for Transnational Meetings and the conference will be paid in addition to this sum. There is a small budget available for materials across the duration of the project (£400-£450), although no physical artwork is anticipated as an output of the work. This role is imagined for an experienced and established individual artist or cultural practitioner, working in any discipline, looking to use their creative skills to contribute to wider society. We anticipate an individual with 5 or more years of experience in the cultural sector will be most appropriate for this role. Experience of building engagement/ developing communications for socially or politically-challenging topics. Knowledge of or demonstrable interest in learning about sustainability-related issues, including climate change. Imaginative thinking and the ability to work with complexity and varying degrees of scale. The artist must be able to fulfil the full duration of the project and agreed timetable (January 2019 – Autumn 2020). Please download the Cultural Adaptations Embedded Artist Brief for full details of the context, partners and activities, and review the skills and experience required as outlined in the Brief to ensure you meet the required experience and abilities. Please note that you must be available for all specified dates in the project timetable (see Brief), and for the full duration of the project. Up to 5 example of projects/contexts where the applicant has contributed to planning and decision making. Please complete the online application by 5pm on Friday 11th January 2019. Shortlisted candidates will be contacted w/c Monday 14th January 2019 and asked to participate in a video/phone call or in-person informal meeting with Creative Carbon Scotland in order to discuss the project, answer any questions, and explore the practical delivery of the project. Following this, shortlisted applicants will be asked to attend an in-person interview (in Glasgow) with Creative Carbon Scotland, SNIFFER and Climate Ready Clyde on Wednesday 23rd January. Cultural Adaptations (EUCAN) is co-funded with the support of the Creative Europe programme of the European Union.